It’s been quite a week for Raith Rovers loan striker Harry Panayiotou. After watching parent club, Leicester City, claim a fairytale English Premiership title on Monday, the 21-year-old came off the bench to head home the only goal at Stark’s Park last night as Raith claimed a 1-0 first leg victory in their promotion play-off tie against Hibs. While Panayiotou was gutted to miss out on the probable once-in-a-lifetime championship celebrations with his home town club - he watched the Chelsea-Spurs game on his own in a Dundee pub - he hopes winning promotion with Raith will make up for it. “I was watching it by myself so I couldn’t celebrate it with anybody, but I was texting some of the Leicester boys afterwards,” he told the Press. “I’m just happy for them and they all deserve it. It’s a dream come true for everybody and if one team deserves it, then it’s Leicester City. “Everyone in Leicester is happy right now and it’s a great time to be there. My family all went to the stadium to celebrate. It was tough not being part of it but I’m there in spirit. Panayiotou has become a cult figure among Raith fans - he even has his own song - and he was over-joyed to have played a match-winning role from the bench in last night’s first leg tie. 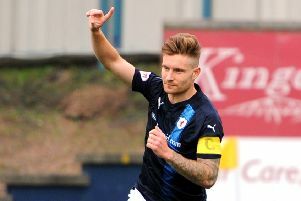 “I can never usually sleep after games and I think I’ve about three hours,” he said upon his arrival at Raith’s training base in Glenrothes this morning. “It was good to score and celebrate with the fans - it meant everything. “I was talking to the physio Stewart and he was saying not many people get a song, so it’s great that the fans have given me one. “I walked off the pitch last night and got a standing ovation with all the fans screaming my chant - it was great. “I’ve never eally experienced anything like that, and I’m enjoying everything about my football right now. “It’s my first proper loan and I wish I came earlier because it’s benefited me a lot. Panayiotou has made eight starts and six sub appearances for Raith since joining on loan and he has bought into manager Ray McKinnon’s squad rotation policy. “You don’t want to be on the bench, but the gaffer can only pick 11 players,” he said. “Everybody has been on the bench - not just me - so everyone has been rotated. “That’s maybe one of the reasons why we’ve been on a great run because we’ve got fresh legs. “The manager has got every tactic right. We defended well in the first half last night, then he brought the attacking players on and we done our job. Myself and Louis Longridge both contributed to the goal. Panayiotou is now looking forward to playing at a packed Easter Road on Saturday as Rovers look to make the most of their one-goal advantage and progress to face Falkirk in next week’s semi-finals. “People say it’s hard to win there (Easter Road), but we don’t need to win,” he said. “They have to win now, and they need to score twice, and stop us from scoring as well. “They have to open up so that’s going to leave them open at the back. That’s where I come into the equation - or Hardie, Louis or whoever may be playing striker. We can do it. “We’re confident - but not complacent. Hibs are a great team - Cummings missed a great chance but on another day he might have taken it. God was on our side. “It’s going to be hard to stop them scoring with all their fans behind them, but when you see Davo, Tosh, Bene and Mango, they are playing superb. They are solid as a rock and it’s hard to break them down.